Node.js is a great tool to use for web scraping. It allows implementing web scraping routines in a couple of lines of code using the open source module provided by npm - the Node Package Manager. As we have already defined - web scraping is nothing more than automating the manual browsing and collecting of information from specific websites in your preferred web browser. The first and final steps are usually pretty much the same, depending on your application's requirements. However, making sense of the HTML content requires you to write specific code for every website you'd like to scrape. DoS - A Denial of Service attack practically relies on sending so many requests to the server that it simply can't handle any more. All new incoming requests would then be denied. If you're scraping a website too often, it can be considered a DoS attack. Terms of Service - Many websites, and almost all bigger websites clearly state that web scraping on their platforms is prohibited. If many people scraped these websites, it would pretty much end up being a DDoS attack, which by itself is illegal. Abusive Software - Many tools and frameworks online offer a large variety of tools and functionalities. Some allow users to fill forms, submit data, upload and download files etc. CAPTCHA is used to combat this, however, even this can be surpassed with a bot. 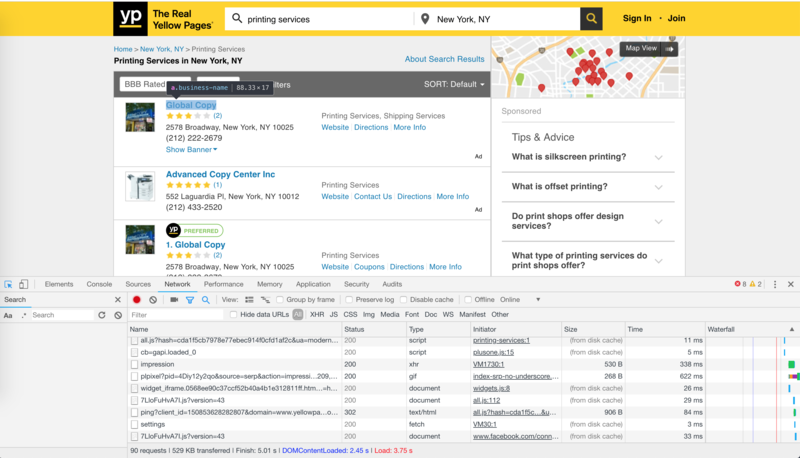 As an example, we'll be looking up the Yellow Pages for companies providing printing services in New York. 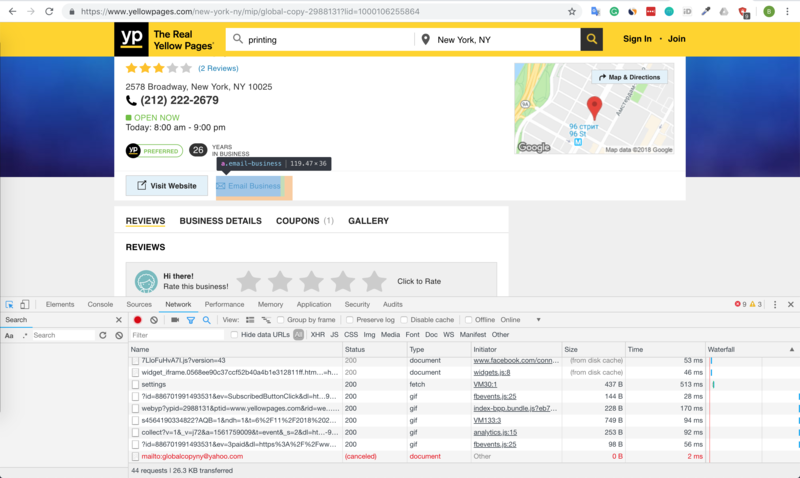 Produce a list of the companies providing printing services in New York in the form of a ".CSV" file that should have the company name, email, phone, and link columns that would describe each company. Repeating these steps multiple time will give us a table filled with company details. To automate the process, we should follow the same steps programmatically. The next step is to install the required modules from the npm. Executing the preceding line in the terminal will install the required modules in the node_modules directory and save them as dependencies in the package.json file. In order to be able to translate the manual algorithm into code, we'll first have to do some manual work using the inspector tool of our web browser. Which is an <a> tag with the class business-name, that holds the name of the company and an href property that holds a link to the individual company page. Both of them will be useful for us in the future. Following the link to the company page, we'll need to find the remaining two pieces of data: the phone and the email. They are located under the <p> tags with the class phone and the <a> tag with the class email-business. Take a note that to get the phone, we'll need the value stored inside of the tag and to get an email, we'll need an href property of the <a> tag. Without getting too detailed about it, you should just know that the functions that return promises, don't return the actual values. In order to get access to the result of the Promise or the resolution value, you should write another function, which should be passed into the then block and expect the value that the Promised will be resolved with. If any error occurs inside of the Promise while it's pending, then it will transition into the rejected state with the possibility to handle the error in the catch block. 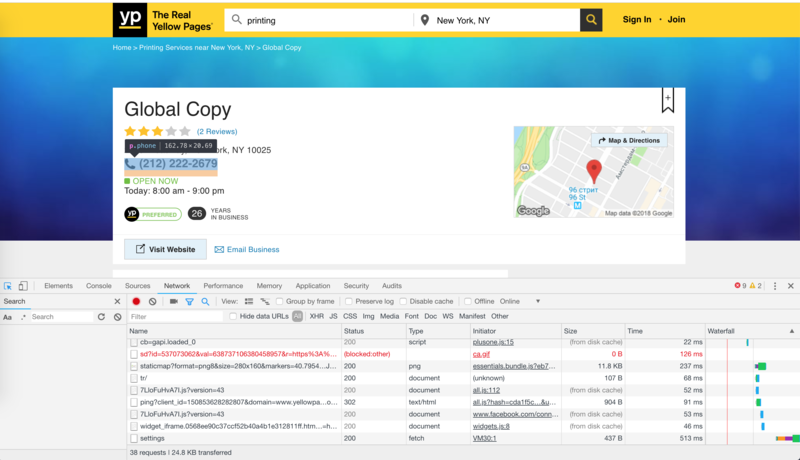 By getting back to the inspector tool, we see that the name of the company could be also found in the internal company page inside of an <h1> tag. The emails are sometimes missing for certain companies and we can't do anything about it. The mailto: prefix could be removed by using a replace function. The getCompanies function returns a promise which resolves into an array of objects prepared to be written to the CSV file, which is done in the first then block. The second one resolves when the CSV file is successfully written to the file system, thus completing the task. We should get an output.csv file right in our working directory. The table represented by this .CSV file contains 4 columns - emailAddress, link, name, phone, and each row describes a single company. In essence, web scraping is browsing web pages, picking up useful information according to the task, and storing it somewhere, all of which is done so programmatically. In order to be able to do this with code, this process should be first done manually using an inspector tool of the browser or by analyzing the raw HTML content of the target web page. Node.js provides reliable and simple tools to make web scraping a straightforward task that could save you a lot of time when compared to processing the links manually. Although it might seem tempting to automate all of your everyday tasks like this, be careful when it comes to making these tools, because they can easily break the law if you don't fully understand the source website's terms or the amount of traffic your web scraper is generating.